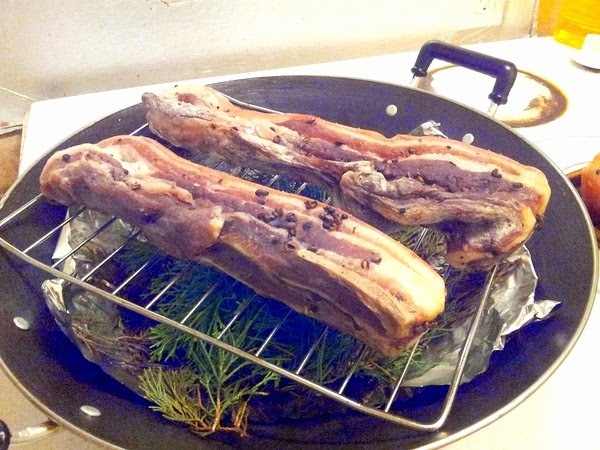 This recipe is not for those cooks inexperienced in curing, smoking and preserving meat. This process is not for the beginner. Thanks for your understanding. I'm always impressed by Chinese food and foodways. With the largest population in the world, throughout my lifetime, they have all had at least one meal a day and now with 1.2 billion, eating 3 meals a day, they eat all the foods there are and not just to stave off the wolf, but in a creative way. This recipe will only approximate the commercially made bacon, which is smoked over several weeks to achieve that unique Sichuanese flavor, color and texture. If you have a smoker, the bacon can be brought into the refrigerator and the smoking continued until you have the desired degree of smokey tenderness. 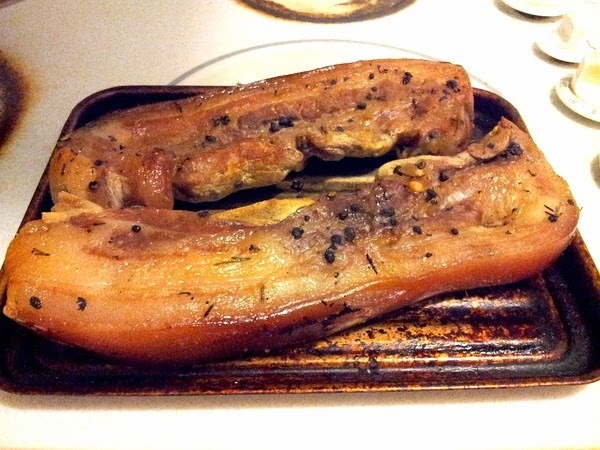 2 to 3 pounds of pork belly - skin removed, ask the butcher to do this. 2 to 3 pounds of ham slices ( 猪肉腿 or transliterated: Zhu Tuirou ) - OPTIONAL Latin and Asian markets have this as a fresh, unsalted, uncured, unsmoked, raw piece of leg. This is what you will ask for. Usually sold whole in 7 to 12+ pounds pieces. Do not remove the fat, but the skin may be removed. Again, ask the butcher to do this. Make a solution of 1 scant cup of salt and 1/2 cup of sugar to 1 gallon of water. Cut the pork, into bacon pieces about 6" long, 1" wide and 1-2" deep. Put the pork in the brine and stand overnight, refrigerate or at least 8 hours (need not be refrigerated), weighted down by a plate or a plastic bag filled with water and tied tightly to prevent leaks. Remove the meat from the brine. Rinse briefly under running water. Mix the marinade and add the brined pork. Refrigerate five to seven days, turning the meat over daily. The meat is now ready to smoke into bacon. Tie butcher twine around the pieces and hang them in a sunny spot on days when the temperature does not exceed 60 degrees F. Place a newspaper under the meat to catch any drippings, weighted down so the wind will not move it. If you have a larding needle, you should run the twine through the meat and make a loop. Truly Chinese Style: use a bamboo skewer and tie the twine to it, to make a "ʎ" shaped affair. Squeeze the pieces, testing for firmness everyday. The meat should give and the desired texture is as supermarket slab bacon. Dry on the outside, moist on the inside. To test, cut a small piece off an end. You may fry the small piece as a taste test as well. Air dry in the sun for one day at a time, testing the bacon by squeezing between the finger and thumb. That is how this is done in Sichuan. Air "cured" in the high mountain air, like Italian prosciutto. If you are concerned about the air drying, skip this step and proceed to smoking the meat. Place a double layer of aluminum foil in the bottom of a wok. Put the rice, tea, tangerine peel and Cypress wood on top of that. Put a grid on top of the wood. There is to be at minimum 1" clearance between the wood and the grid. Put the lid on the wok, turn on the exhaust fan, or close the kitchen doors and open the window. Bring up the heat and smoke the meat, adding more Cypress wood. Smoke up to 20 minutes. Allow the meat to cool to room temperature. That portion not immediately used should be wrapped tightly in plastic and frozen. Refrigerate the piece for immediate use, none the less. Curing NOTE - If you use Pink (Curing) Salt use a teaspoon per pound of meat, if Morton Salt's Tender Quick, use 1 tablespoon per pound of meat. Pink salt is NOT the same as the now trendy Himalayan "Pink" Salt. http://www.douban.com/note/326018937/ - photos used by permission.